So my transformation started...and here's how I did it! 1. 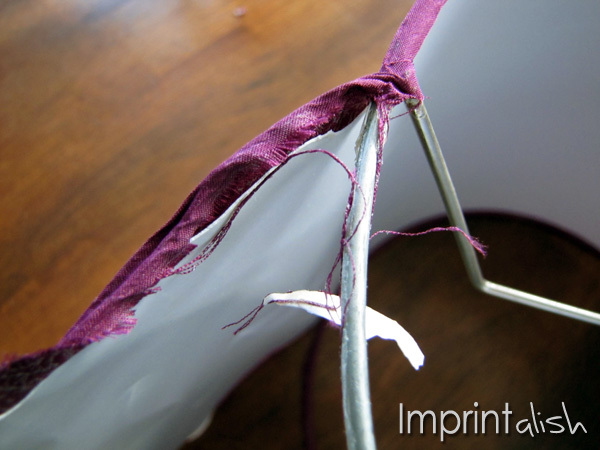 Remove the fabric and glue off the current lampshade to expose the two rings (top and bottom). I used scissors, a utility knife, Goo Gone and lots of elbow grease! 2. Spray paint all lamp pieces black. 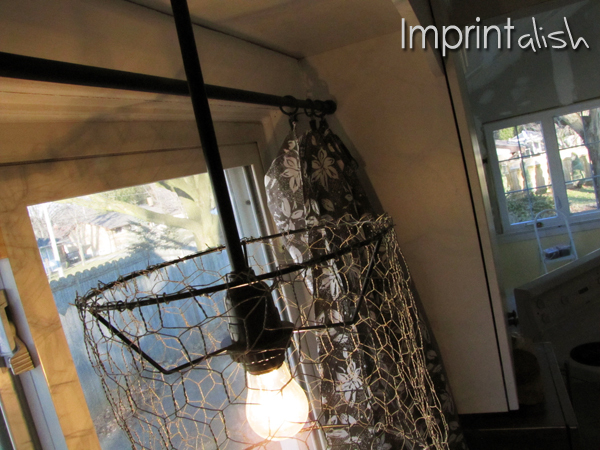 I folded my sheet of chicken wire in half to make it look a bit thicker when on the lamp. I then measured out the length I needed by wrapping the wire around one of rings. I left a little extra at the ends so I would have some playing room when fastening it together. 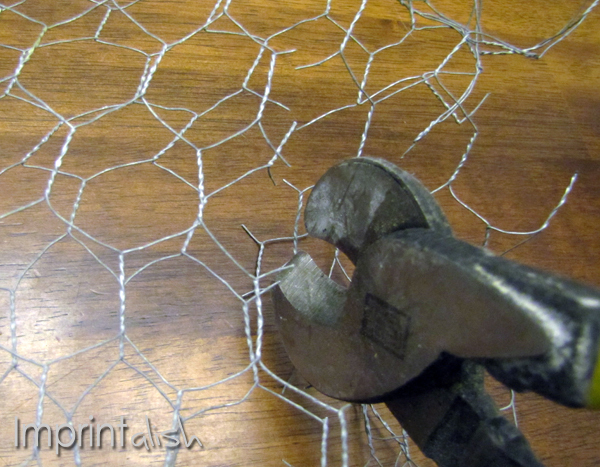 Then, cut the chicken wire to the desired size. 1. Warning-this project is not good for your manicure! 3. I then went back over the folded edges and used pliers to make sure it was good and tight. 4. With the bottom finished it resembles a cylinder shape. 5. Gently push the top ring inside the cylinder shape. 6. Position it at the desired height. 7. 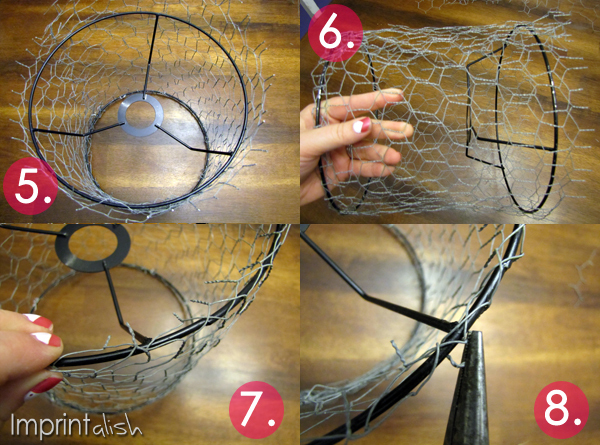 Bend the chicken wire around the lamp shade ring as you did for the bottom ring. 8. Use the pliers to tighten the wires in place. Voila! 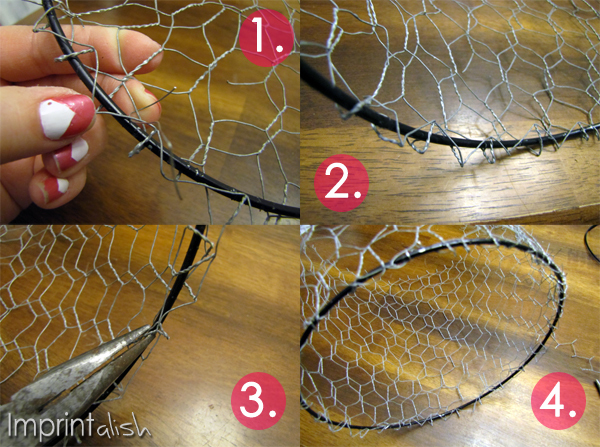 Your finished chicken wire lamp shade. ...Get your husband to do it! LOL! I love it! It's whimsical, rustic, modern and kitchy all in one-totally me! I love the way the light dances on the ceiling too! That looks amazing! What a neat idea. 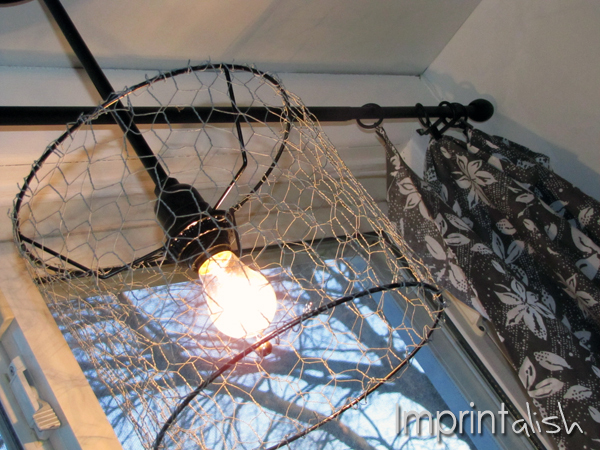 I am a new follower through your grow your blog series..
OK, the chicken wire wouldn't work with my decor personally, but I LOVE that you just used a regular lamp for this!! How innovative! Oh my gosh! I LOVE THIS! You never fail to surprise/amaze me with your craftiness. Thank you for being part of the blog hop. I became one of your followers. If you get a chance, I would love for you to stop by my blog sometime. I love this idea. I may have to borrow it for my not-lit-enough kitchen. Thanks for the tutorial. ooooooo I love this!!!! Amazing! :) Great job! You rocked this! This is great...cheap, clever, and stylish. Perfect combination. that's perfect! can't wait to see the finished space! thanks for linking up to tip-toe thru tuesday! This turned out really great! This leads to so many possibilities - I'm currently trying to figure out what to do with ugly glass shades on pendant lights in our kitchen...You've got me thinking! So fun! Stealing this idea for my porch! What a smart idea! I am sure you are loving it! We would be thrilled for you to share this at our link party! Our readers would enjoy it! 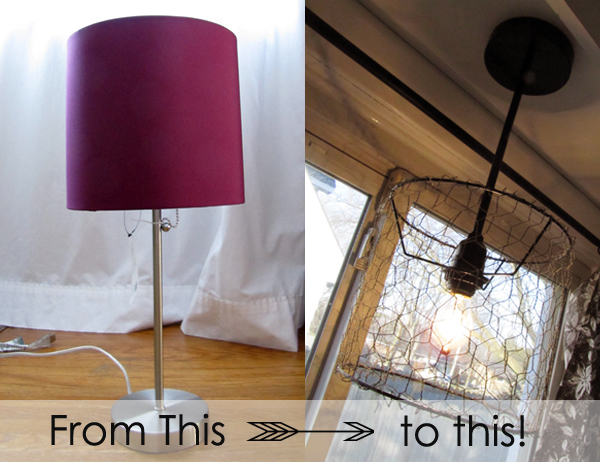 Love what you did with this light! I'm loving this lamp, it came out great. What a great idea to hang the whole thing from the ceiling! LOVE THIS! 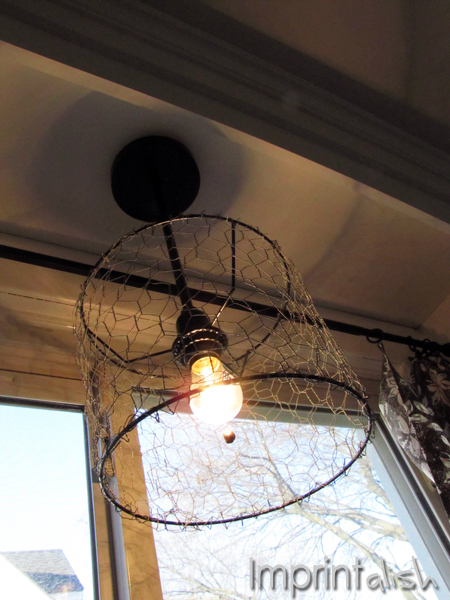 I'm all about chicken wire, pendant lights, and of course, DIY transformations from blah to aaahhhhhh. Who would have thought to turn a lamp upside down??!! I'd love it if you'd share this at my Show & Tell party, going on now @ the Delectable Home. What a great idea! I love the way it turned out. It looks awesome! Holy craption! If I didn't love you so much... I would SO hate you! This is super cool. Wow! That is so very cool! I love the step-by-step photos too. Saw you at Happy Hour Projects. Nice job! Oh, this is too cool- LOVE this!!! Love this lamp! You did an awesome job! Found you via TT&J. WOW!!! This is SO clever! I like it a lot! Thanks for sharing. Oh WOW, how great is that! What a creative idea. Love it!! Your pendant turned out gorgeous! 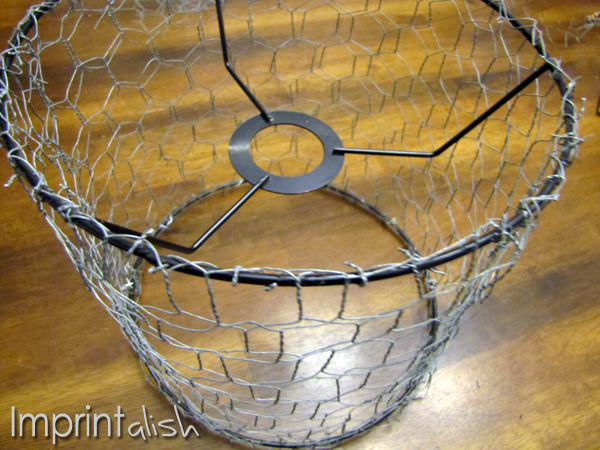 I've got this linked to my chicken wire post too today, for inspiration! Cool look - for cheap!! i like it~!! I'll be featuring you later today! Thanks so much for linking up!! I just stopped over from your feature on 52 Mantels. What a great idea that shade is, I'm gonna pin it. This is unique and cool - love!!! I am currently having a linky party on my blog and I would love if you came by to link this up! I would love to have you! 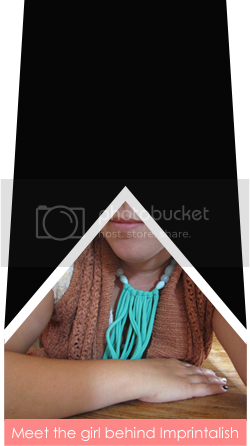 Featured your project today - it is awesome! Come and have a look and grab a button! Love it! Love it! Love it! And would love for you to share on our Creative Corner Blog Hop Creative Corner Hop. This is great! Just found you from the blog hope. We hope you will check out our blog!